Like many of you, I've been really excited to see Accident Man for a long time. Some time last year, I'd heard on the grapevine that, even by Scott Adkins' standards, this was shaping up to be something special. And then the trailer arrived online, and the Action Film community went nuts. The cast looked perfect. The playful banter narration was spot on. The action looked incredible. The film was scheduled for a February release and we could not wait to see it. Then, Sony UK decided to delay the UK release by two months! This was a nightmare for UK fans, because it meant that for those inclined not to wait (or pay), there would be a pristine condition version of the film available on illegal download off the internet, months before its official release in the UK, which is bound to affect sales of the film. We UK based reviewers have had to sit on our hands while our US counterparts wrote all about the film and how good it was. The UK delay meant that a few, a very lucky few, were able to attend a special big screen premier of the film, courtesy of FightingSpirit and Sony UK, with the man himself in attendance to take part in a Q&A afterwards. The event took place at the Mockingbird, an independent cinema situated in Birmingham's Custard Factory. It was a small but perfectly formed venue and the staff were very accommodating and patient with us all knocking about the place! It also had a decent bar and menu, reminding me of Bristol's own Watershed cinema. Every town needs a place like this. The Fighting Spirit team of organisers, led by Soo Cole and Weng Yu, were fantastic and ran the event very professionally. Everything (seemed) to run on time but no one felt harried or rushed. One of the things I really liked occurred even before the day itself, as a whatsapp group was set up for the critics, allowing us all to introduce ourselves. This paid dividends on the day as people were already more familiar with each other. A great example of the community spirit the organisers are trying to build. As well as Scott, there were a number of other film-makers and martial artists present. The day's programme also included the three winning shorts from the last Fighting Spirit Festival: Blindsided, Kowloon Killers and Express Delivery. In addition there was the slick, tongue-in-cheek short FIXER, by Matt Routledge who was also in attendance. Although Eric Jacobus (Blindsided) couldn't attend, there were people from both of the other films, including Leif Johnson, director of Kowloon Killers and Beau Fowler, director and co-star of Express Delivery, and his co-star Sonny Louis. Beau and Sonny were great to talk to and it was heartening to hear that with the help of producer Eloise Carrow, their short film is being developed into a full feature. 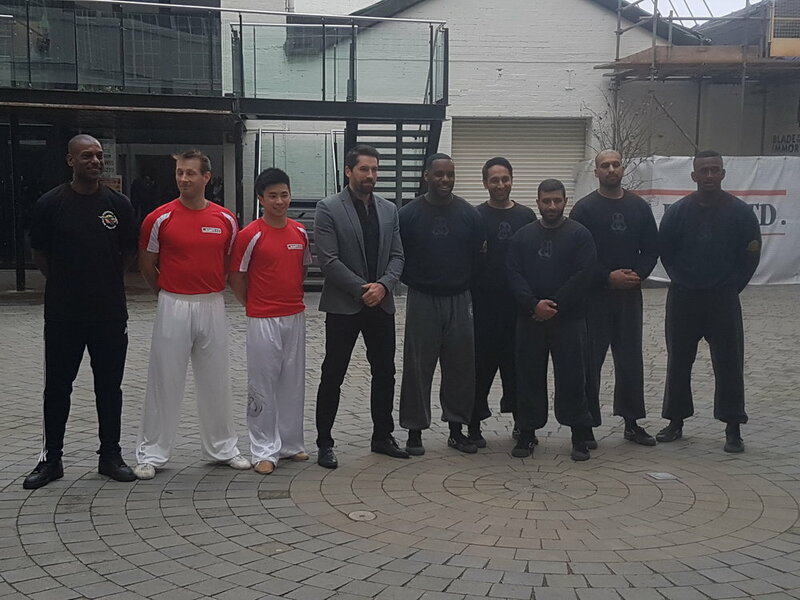 There were also a couple of excellent martial arts demonstrations which took place in the courtyard outside the cinema. Sam Mak and Steve Coleman are UK Wushu Champions, and provided an excellent display showcasing why they are the best. Then it was the turn of local exponents of Southern Mantis kung fu to take the crowd through a series of bunkai drills (showing how their style can apply in real-life confrontations) and finished off with an impressive set of press-ups! Before I got to interview Scott, I was able to pick up a couple of other interviews on the day, which will form part of the next article on the event. The affable giant that is Leif Johnson had appeared as a guest on my podcast, The_DTV Digest, and he'd brought with him one of Kowloon Killers' actresses, Lisa Ronaghan. I was able to talk to her briefly about her work and I'll be posting that interview in the next article. I was also very happy to be introduced to Jadey Duffield and Steve Raeside, from DreamMore Films. They are about to go into production on a new feature starring Jailbreak's Jean-paul Ly - more on that in the next instalment!